Autosomal recessive polycystic kidney disease causes renal and hepatic dysfunction in childhood. We describe the clinical outcome of 52 children with this diagnosis born between 1950 and 1993. Currently 23 are alive, 24 dead and 5 have been lost to follow-up; 1 has been dialysed and 7 transplanted. 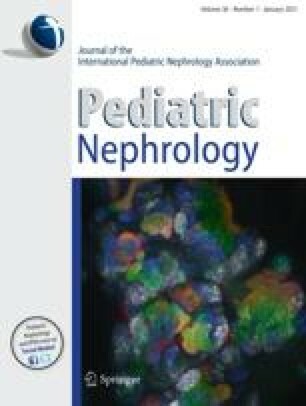 Life-table analysis of the patients surviving the 1st month of life revealed an actuarial renal survival of 86% at 1 year and 67% at 15 years. The probability of requiring anti-hypertensive treatment was 39% at 1 year and 60% at 15 years of age. Bleeding from gastro-oesophageal varices occurred in 8 patients at a mean age of 12.5 years, and was preceded by haematological evidence of hypersplenism in 6 of them. The study indicates a relatively good prognosis for patients with this condition who survive the neonatal period and emphasises the importance of early detection and appropriate management of systemic and portal hypertension.